an extremely variable eczematous dermatosis presumed to be a cutaneous response to prolonged vigorous scratching, rubbing, or pinching to relieve intense pruritus. It is believed by some authorities to be a psychogenic disorder. The term is also used to refer to lichen simplex chronicus(circumscribed neurodermatitis) and sometimes to atopic dermatitis(disseminated neurodermatitis). 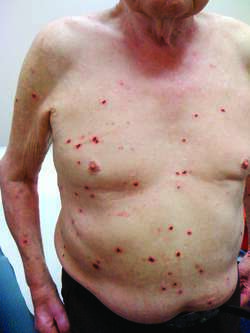 A chronic lichenified skin lesion, localized or disseminated. /neu·ro·der·ma·ti·tis/ (-der″mah-ti´tis) [Gr.] a general term for an eczematous dermatosis presumed to be a cutaneous response to prolonged vigorous scratching, rubbing, or pinching to relieve severe pruritus; believed by some to be a psychogenic disorder. a nonspecific pruritic skin disorder seen in anxious, nervous individuals. Excoriations and lichenification occur on easily accessible, exposed areas of the body such as the forearms and forehead. Sometimes loosely (and incorrectly) referred to as atopic dermatitis. See also lichen simplex chronicus. (1) Atopic dermatitis, see there. (2) Cutaneous neurosis—lichenification of skin due to constant rubbing and scratching. A chronic lichenified skin lesion; loosely applied to atopic dermatitis. Chronic superficial inflammation of the skin characterized by thickening, excoriation, and lichenification, usually beginning in infancy. It is common in families with a high incidence of allergic diseases. Skin damage and thickening caused by scratching, usually without an organic basis. Also known as LICHEN SIMPLEX. An itchy skin disease (also called lichen simplex chronicus) found in nervous, anxious people. a general term for a dermatosis presumed to result primarily from self trauma, usually scratching, from behavioral causes.